A Staff Meeting to Remember | "Here I Stand"
Unbelievable. Amazing. Awesome. Impossible. Words like that were used over and over during three days in Eugene, Oregon, last week. 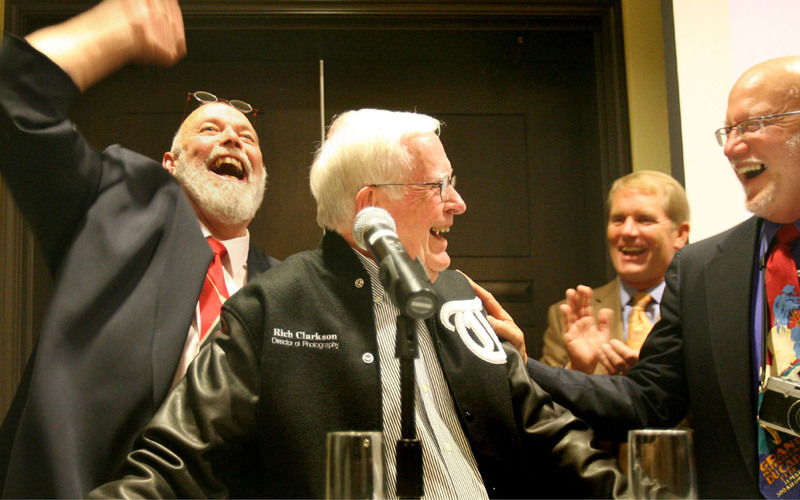 All that amazement was lavished on the reunion of Topeka Capital-Journal photographers and lab men held to honor their esteemed director Rich Clarkson. That 35 alums would travel great distances to honor their former leader is quite a testament to the influence Clarkson had on each of the photographers. Standing back and looking over the crowd, photographers would shake their heads in disbelief that so much talent was gathered in one room. Still, not one of us now doesn’t know that all the instruction, the guidance, the unrecognized support and even the hatred that came out of those years helped shape and hone us for our days ahead. The Capital-Journal was not a final destination. It was only the jumping off point for some amazing careers. In my early 20’s as my career began to really grow, Clarkson in a very pointed review of my work made it clear that what he did for me and the staff was to put us in positions to make great pictures. All the other Clarkson instructional phrases that I carry with me to this day really were secondary to that one simple fact. Clarkson taught us to be great, and to varying degrees, we have all been great. Together all that honing helped us become the sharp blade of his very stout knife that left a mark on photojournalism never to be matched. That’s where the love comes in. As always it took time and distance to realize all of the lessons. Scars remain, but each of the photographers that returned had long ago privately offered up their thanks to Clarkson. The time had come to finally make those thanks public in a very wonderful and grand reunion. To pull all this off took a big man, and they don’t come bigger than Brian Lanker. 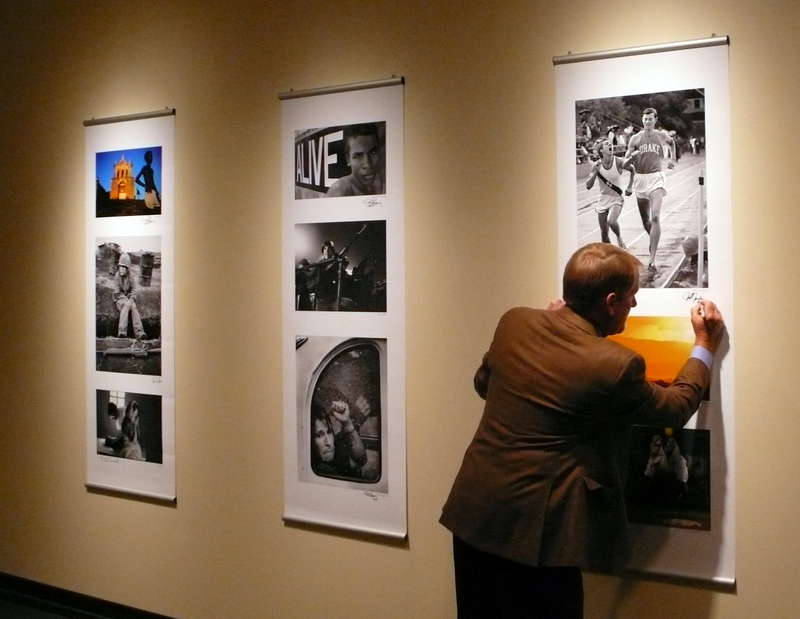 A two-time National Photographer of the Year and a Pulitzer Prize winner, Lanker’s photography career is legendary. Lanker came to Topeka as a young photographer already gifted in his visual and artistic abilities like few others. In his early years, no one suffered as much under the tutelage of Clarkson as did Lanker. Out of that agony, though, came the ecstasy of photographs that were filled with visual talent yet told real stories in ways that could only make Clarkson proud. During a long conversation about a blog post I wrote last August involving Lanker, me, Clarkson and our car two-way radios, I made a simple statement that we ought to have a reunion. By the next day, Lanker was back to me with proposed dates. For the next 11 months, the reunion became a Lanker crusade beyond belief. Through all the planning every effort was made to surprise Clarkson. The next morning, a bus carried all to the spectacular King Estate Winery. Our hosts had Kansas ties and welcomed us with a brunch, wine tasting and a thorough tour. Then “The Book” was revealed. Photographs submitted by each photographer from their time in Topeka and from their careers after Topeka were carefully scanned by gifted alum Carl Davaz and then put together in a hefty six pound, 250-page book designed by Lanker, Davaz and alum Gary Settle. With financing help from National Geographic, whose Editor in Chief just happens to be another great Topeka alum, Chris Johns, the book was a marvel. Everyone gathered around Clarkson as he thumbed his way through the book. Each quiet comment from Clarkson about a photograph brought smiles of satisfaction from the photographer just as it had in the years of work in Topeka. With each turning page, the emotions began to grow in Clarkson, but there still wasn’t the complete breakdown on Clarkson’s part. 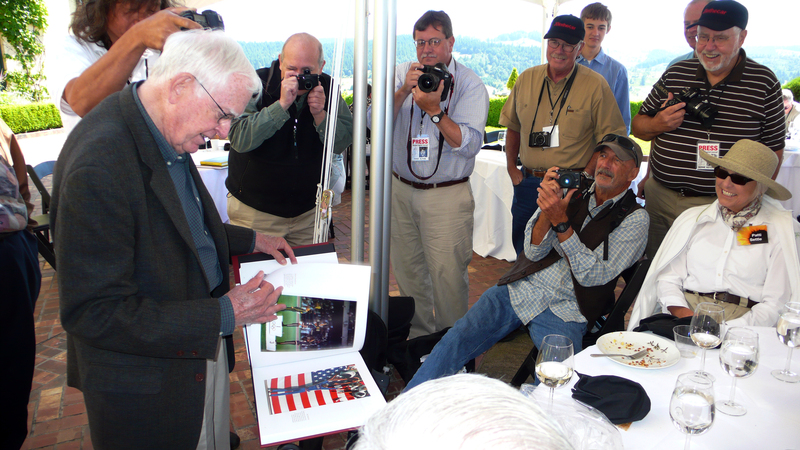 The remaining hours at the Estate were devoted to getting autographs from each photographer in a book far more cherished than any high school yearbook could ever have been. That evening at the Jordan Schnitzer Museum at the University of Oregon, a special display of the photographs lined the walls where a formal dinner was held. The museum announced they would remain on display for a month. Each photo was personally autographed along with our car radio numbers. Mine was 27, and it was a real honor to sign my prints. 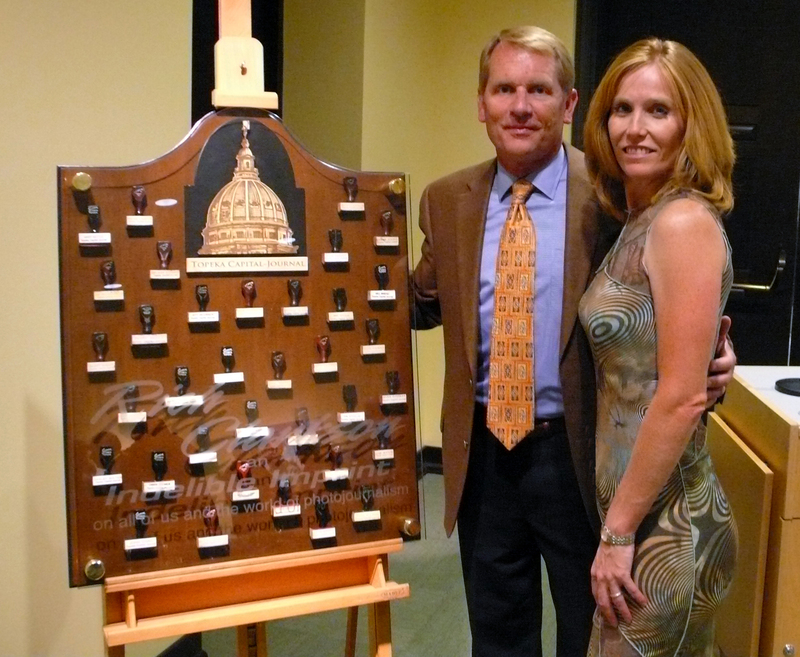 In another museum room, the special events of the formal evening began with a beautiful video showcasing photographs of all of us at much younger ages during our times in Topeka. The cheers that greeted each old photograph soon gave way to much more quiet moments of reflection as we all knew what awaited us. The photographs of the late Delmar Schmidt hushed the crowd and tears began to well in all of us. The lab technician for most of the Clarkson years, Schmidt was truly beloved. 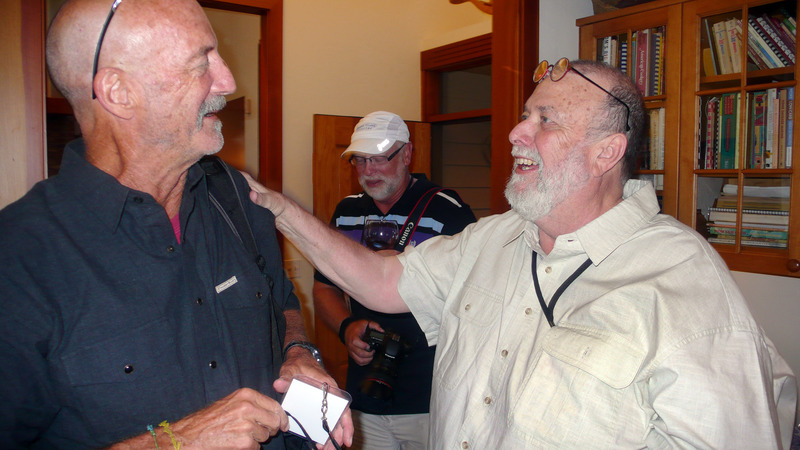 Schmidt was the salve for wounded hearts and souls during our Topeka time. The video was one of the most poignant presentations of the entire event. There were elaborate and wondrously designed letter jackets to be presented first to Clarkson and others who purchased the jacket featuring John Brown in his famous pose holding an old Speed Graphic camera in one hand and a flash unit in the other. Standing in his letter jacket, Clarkson finally was overcome with emotion and the tears did flow as he eloquently tried to downplay his role in everyone’s success and then revealed he had been wrong all these years. We weren’t “the worst staff ever.” In fact, he now fully believed we might just have been the best staff ever. We all were pleased, but for Lanker this was his just desserts for a job so well done. The smile on his face, the waving of his arms and the shouts of joy were priceless to see. It had been all worth it. Still there was one final presentation to be made. This was a task Lanker had bestowed on me. Something very Capital-Journal had to be given to Clarkson as a lasting memento. I really felt the pressure to get this right and had sweated the creation and delivery. Throughout the Clarkson era that ran from 1957 through 1981, each printed photograph bore the stamp of the photographer and the Topeka Capital-Journal. When a photographer moved on, the stamp could not. 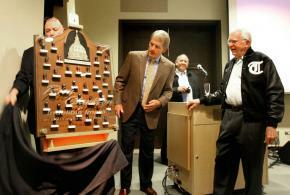 Those stamps were collected by Delmar Schmidt and stored in a box in his locker. That collection struck me as the perfect gift. With help from current photo director Thad Allton, the stamps of the attending photographers were collected. With an idea in mind, I met with gifted designer D.W. Acker. Together we discussed my concept and Acker went on to create a gift of beauty with attention to detail that Clarkson truly appreciated. The etched glass sentiment summed up the event. “Rich Clarkson – An indelible imprint on all of us and the world of photojournalism.” While I stood off to the side, Laura told me that Clarkson was completely overwhelmed as he studied the plaque. The others all raced up to see their stamps on the large plaque. I couldn’t have been happier. The final day was devoted to fun. Golf, white water rafting and hikes filled the day as we enjoyed the beauty of Oregon outside of Eugene along the McKenzie River. Another huge spread of food that I will be riding off for weeks featured chickens that gave up their lives to cooking skills of alum Harley Soltes who raised them, marinated them and grilled them to perfection. The night was filled with final stories and lots and lots of laughter. Now as I sit back and consider all this, I am struck by one overwhelming thought. Oh, how I do miss them all. I walked into a world of wonder 41 years ago. In 10 years of work I cannot remember any staff member every talking about how much they were paid. No one said a thing about how much they worked. Overtime never entered our minds. We ate together, we drank together, we partied together. If we got on each others nerves, we quickly settled our differences and went right on as though nothing had ever happened. The sole purpose of our existence was to refine our craft, tell wondrous stories with pictures and to excel so that we might serve the readers of the paper. In the process we hoped to garner a small bit of praise from Clarkson or at least know we stuck it to him. We were a staff united in the truest sense of the word. 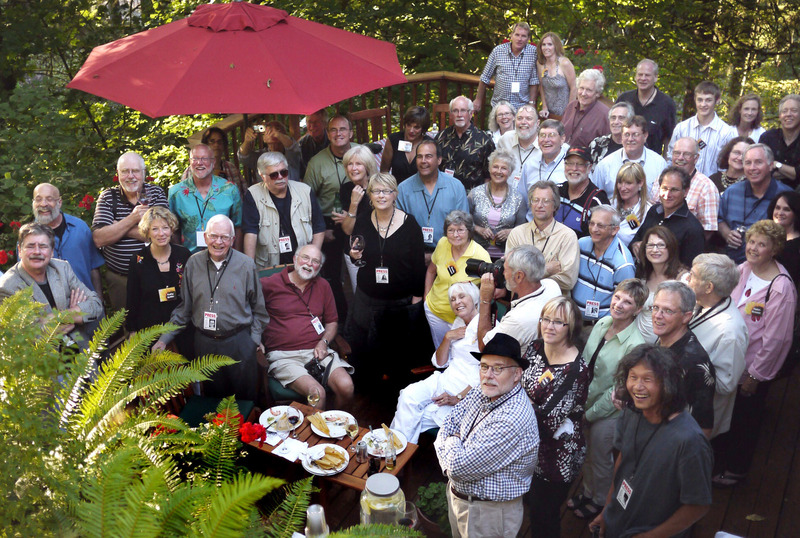 Gathering in Eugene only reinforced that feeling. Whether you once worked in the lab like my great Topeka friend Mike Van Dyke or were Clarkson’s last hire just months before he left Topeka like Thad Allton, you were immediately struck with that staff feeling again during the reunion. We celebrated Susan Biddle being a former White House photographer, but we also celebrated that Berne Ketchum, in retirement, is the mayor of the small town of Rowan, Iowa. David Alan Harvey might be a renowned National Geographic photographer, but he’s just as well known for his celebrated life that many feel was the basis for the lead character in The Bridges of Madison County. Chris Johns now heads the National Geographic, but he once was “the other intern” when the President’s daughter Susan Ford came to work at the paper. 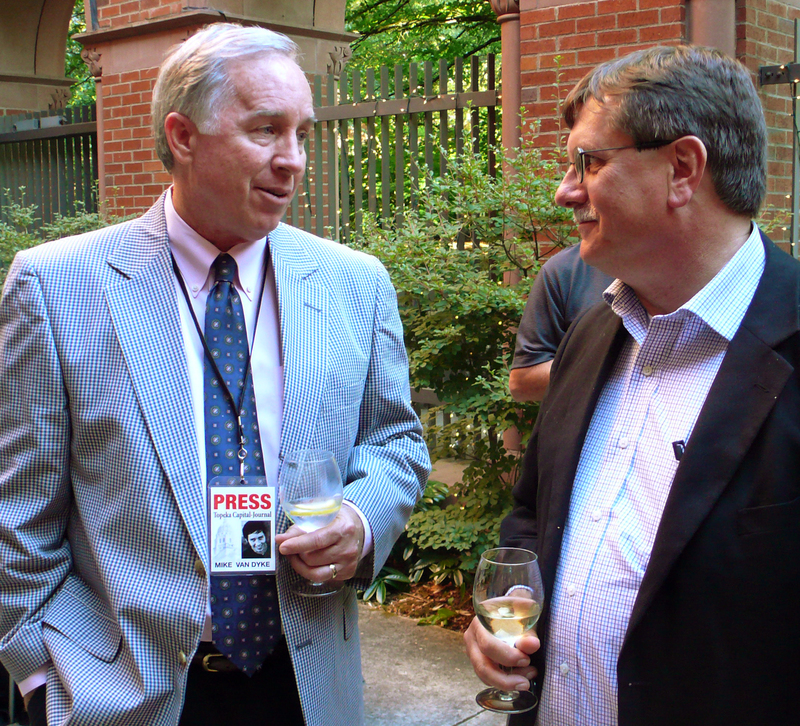 Hal Stoelzle was part of two Pulitzer Prize winning teams at the Orange County Register and the Rocky Mountain News, but John Chao has been part of two Olympic teams for Taiwan in sailing and windsurfing. Jim Ryun was once the world’s fastest miler and a former U.S. Representative from Kansas, but George Olson can still outrun him on a track with his collection of classic Mini Coopers. This entry was posted in Uncategorized and tagged Barry Sweet, Berne Ketchum, Bill Ballenberg, Bill Kesler, Bill Snead, Bob Graves, Brian Lanker, Carl Davaz, Charles Kogod, Chris Johns, D.W. Acker, Damian Strohmeyer, David Alan Harvey, David Griffin, David Peterson, Delmar Schmidt, Gary Settle, George Olson, Hal Stoelzle, Harley Soltes, Jack Kenward, Jeff Jacobsen, Jim Forbes, Jim Richardson, John Chao, Mark Godfrey, Owen Brewer, Perry Riddle, Phil Schermeister, Rich Clarkson, Rod Hanna, Sarah Leen, Susan Biddle, Susan Ford Bales, Thad Allton, Topeka Capital-Journal. Bookmark the permalink. Great article Jeff. I always thought it was cool that so much of the infrastructure at The Register-Guard where I worked once originated from what Rich passed on to Brian and Brian on to Carl. I was even issued a radio number even though we didn’t have any radios. Good work on the party, Rich deserves it. He’s a true American. Great story, Jeff. I love the letter jacket. I just missed the Clarkson era by a mere 3 months. Something I’ve always regretted. It’s a shame what has become of that paper. That’s something that has bothered me for years. As the DP, I always felt like the boy with his finger in the dike, trying to salvage some shreds of what Clarkson built at the C-J. And failing miserably. It was great to read all about this. 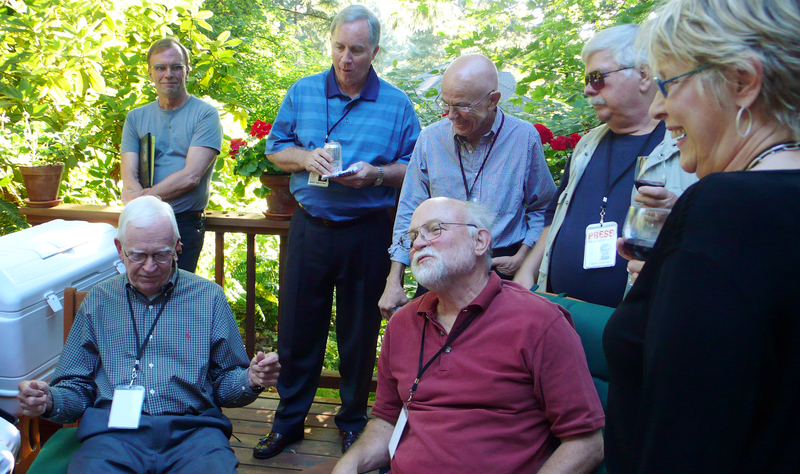 Jeff — That’s a wonderful account of a once-in-a-lifetime gathering as tribute to Rich, as well as a special remembrance of the experiences all of us loved/hated in that time — those years of shared history that compelled us to come to Eugene. Just came across this blog. What a great read, Jeff! I thoroughly enjoyed your account of your fabulous event for Rich Clarkson. I love the photo-credit stamp plaque you helped put together. A touching gift for Clarkson. I hope you and the other C-J photographers I worked with in my 18 years in Topeka are doing well. Ah, those were the days. Pingback: A Prayer for a Genius | "Here I Stand"
Pingback: Let Me Take You On A Trip | "Here I Stand"
Pingback: The True Mr. Jayhawk | "Here I Stand"